Jamie Devitt could return to the starting line-up against Newport on Saturday. 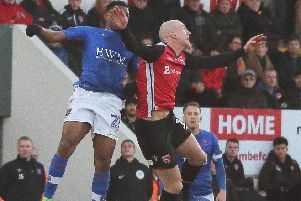 Jim Bentley has ruled out making wholesale changes to his side for Morecambe’s game against Newport County on Saturday. The Shrimps boss labelled his players “weak” on Tuesday night after they conceded two goals in the final five minutes to lose 2-1 at home to Mansfield. Bentley however doesn’t think anything would be served by ripping up his plans and starting again when the Exiles visit the Globe Arena. He said: “Too many changes can have a negative affect because they’ve not played together. “You can’t kneejerk because one game wasn’t good enough and leave as many out as you can. “Sometimes you’re damned if you do and damned if you don’t. “We’ll assess Newport and will pick a team to go out and win that particular game. “I always say it’s not about the starting XI it’s about the 14 that you get on the pitch. “Not so long ago we looked at a stat that our subs had scored more goals than anyone in the country. Thinking long-term was the reason Bentley left out three key men in Shaun Miller, Jamie Devitt and Tom Barkhuizen for the Mansfield clash. The Shrimps boss wasn’t giving much away on their possible returns to the starting line-up. He said: “We’ll see what’s what. “The squad’s not bad at the minute. (Aaron) Wildig and (Aaron) McGowan are still struggling with injury so we’ll see how they come along. “We’ve played so much football though. Tom Barkhuizen hasn’t played 90 minutes in the last three years and then he comes here and next thing he’s played nearly 2,500 minutes and we’ve got 19 games to go. “It’s a big ask. He was out on his feet at Northampton on Saturday and you’re running the risk of injury. “I think we did the right thing with him and he came on and affected the game on Tuesday and he’ll be better for it going forwards. “Devitt’s had a bit of a calf problem and Shaun Miller we left out because Mullin scored at the weekend and we’ve played him and Kevin (Ellison) up front in the past in that formation.